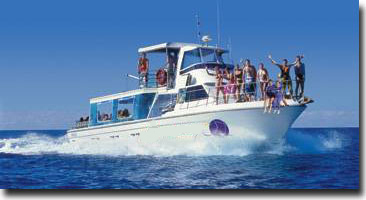 You can take the Great Barrier Reef day cruise to Hardy Reef. There are different ways to explore the reef. The underwater viewing chamber, the semi-submersible submarines, snorkelling and of course scuba diving. Certified divers are taken on instructor guided dives so that you will see the very best sites. Also available are introductory dives for those who are not qualified but would like to try scuba diving. No better place to start than on the Great Barrier Reef. 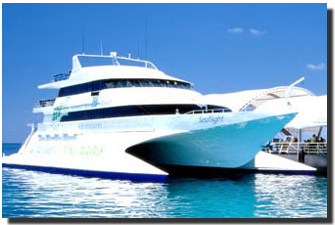 You can also take a day cruise to diving and snorkeling sites in the Whitsunday Islands. There are many beautiful ares of fringing reef around the islands where you can experience the beauty of coral and marine life plus you will visit Whitehaven Beach - a spectacular expanse of pure silica sand stretching for 7 kilometres along the eastern coast of Whitsunday Island and an absolute 'must see' for any visitor to the Whitsundays. 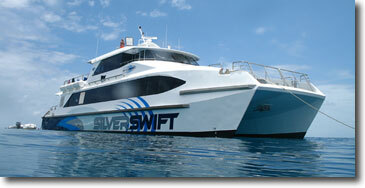 The Great Barrier Reef day dive cruise from Cairns is pretty special. The modern, fast, powered catamaran maintains a high staff to guest ratio to ensure that you are well looked after. The Great Barrier Reef is much closer in Cairns than in the Whitsundays so your travelling time is reduced giving you a longer time to enjoy the reef.